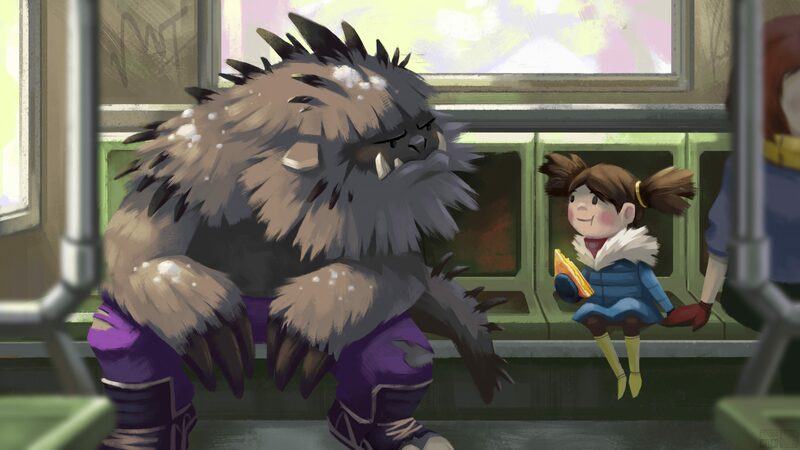 A big bad thing boarded the bus. And started quite the fuss. GAA! GAA! GAANZA! He howled and yelled. But then no one looked. despite his breath that smelled. nor moved from where they perched. She stared straight in his eyes. The big bad thing waggled his claws. The big bad thing gasped. “She can see… me?” he paused. He blushed bright and smiled at the tyke. to gently pet his spikes. Gaa. Gaa. Gaaanza. The bad thing purred. His heart soared like a bird. A bell rang; brakes smoked with a screech. Then the doors flung wide. the girl gets pulled from reach. Then doors shut with a SMACK! ‘Til “Pig Tails” was gone. He looked down at sandwich in paw. His eyes widened in awe. The big bad thing started to smile. and warmed his heart for miles. Butter each slice of bread on both sides. Place onto skillet over medium-low heat until it begins to turn a light golden brown, about 3 to 5 minutes. Using a spatula, flip over both slices of bread. Place a slice of the mild cheddar on one slice of bread and the Monterey Jack cheese on the other. Brown the bread until the cheese on top begins to melt, about 3 to 5 minutes. Once cheese is melted, flip one of the slices of bread onto the other and press together to form a sandwich. Transfer to cutting board to rest, about 2 minutes. Cut in half diagonally and serve. 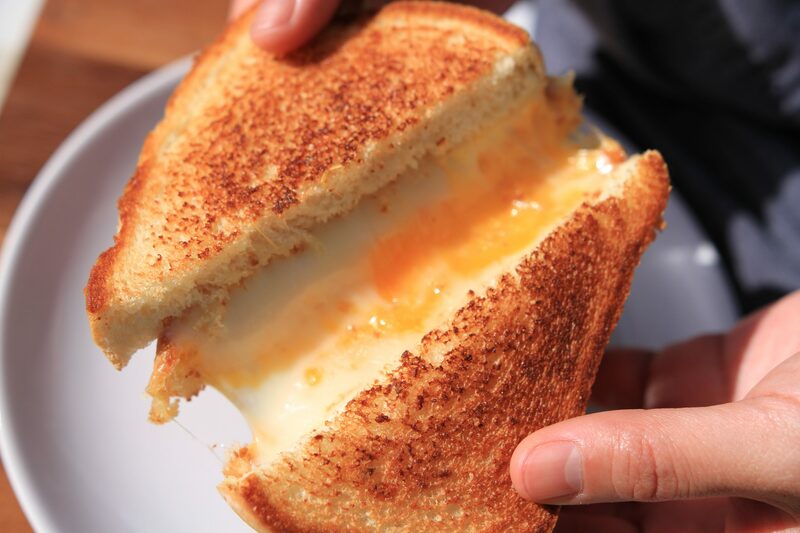 A tip to having a flavorful, melty and non-floppy grilled cheese sandwich is to butter and griddle the two slices of bread on both sides – yes – including the inside faces where the cheese will be. Griddling both sides gives the bread more structure to hold up better when the sandwich is sliced diagonally in half (instead of getting squashed). Placing the cheese on the toasty browned inside surfaces also allows it to start melting faster while the outside is being griddled. 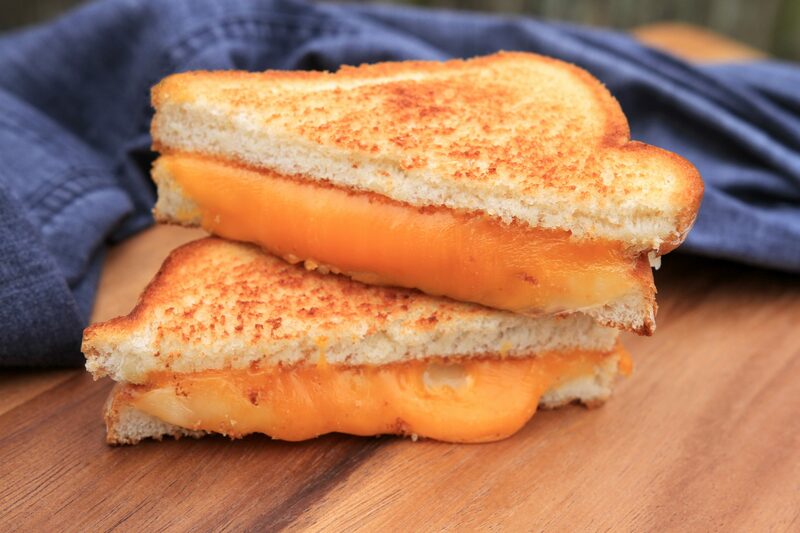 Grilled cheese is very versatile and there are hundreds of recipes in books and online that share delicious variations in the types of cheeses, breads, condiments and add-ins of fruits, vegetables, meat and even herbs. My favorite variation is to add a slice of ham or couple slices of bacon and scrambled eggs to make a breakfast sandwich. Why do different cheeses melt in different ways? Cheese is simply water and fat that are bound together by protein molecules. Cheeses that have a higher water content, like mozzarella, brie, Gruyère and Jack are good melters, while drier cheeses like Parmesan or Pecorino-Romano often separate into clumps or break. That is why those drier cheeses are good for grating and sprinkling on top of food. Some cheeses, like those set with acid, will not melt at all. Acid-set cheese include fresh goat cheese, paneer, queso fresco and ricotta. This poem was inspired by a homeless man getting on public transit and the way people around him pretended that he didn’t exist even though he tried talking to them. Eventually he started to sing to himself and it struck me that no matter what mental state we are in or how different our circumstances may be, we are all still living beings that take enjoyment from certain things like music or food. These joys of life are universal and cut across differences in religion, age, culture, education, income or occupation. I wanted to write a story that exhibited the power of how food, especially a comfort food such as grilled cheese, can bridge those boundaries. I love this so much. I am excited to make this, it looks delicious! Thank you! I love the “pig-tailed sweetie pie” stanza. This is a touching poem and makes me want grilled cheese desperately.